Delicious milky way caramel snowmen. milk chocolate and caramel all shaped like a snowmen it doesn't get better then this. 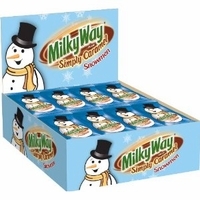 milky way simply caramel snowmen is a new Christmas candy this year. you get 24 1 oz caramel snowmen per box. this are a great Christmas stocking candy and makes a wonderful Christmas present for anyone who likes milky way candy bars. Please note that the packaging has been changed and no longer come in a blue wrapper.